"How To Train Your Mind to Work Like a Human Computer in Only 30 Days!" Have you ever walked into a room and couldn't remember what you went there for? Have you ever grasped the hand of a potential client and then when the hand shake broke, the name seemed to disappear from your memory? Or have you ever left a prospect or an important meeting and as you drove away remembered a key point that you should have shared with them? The problem is NOT with your memory. The problem is with the "Filing System" your brain currently uses to store and retrieve memory items. Change the filing system and you'll double and even triple your memory comprehension. Routinely memorize 100 digit numbers after hearing them only once! Develop a Super-Power Memory even if it seems like your memory has been declining with age. Instantly recall names, facts, details, information, sales materials, technical materials, and even birthdays! One-up your competition by staying on top of late-breaking news and critical information important to "success" in your industry with "minimum" effort! Your competition won't know what hit them! Get better grades in school studying HALF the time! OR improve your child's grades in school to help guarantee their success in life! Imagine the "Pride" you'll feel as a parent...and the self-esteem & confidence your child will have in themselves! Develop a keen focus and concentration on your reading materials in the toughest of environments like: airplanes, at home with noisy children, at work with loud coworkers, etc. Increase your reading speed in only 1 hour! Actually keep up with all of your pleasure, academic...or even work related reading materials! No more piles of unread magazines, books and reports. Recall names and faces even years later and astound friends, family, and coworkers with your new abilities and knowledge! Dramatically improve your comprehension skills to not only keep up with all of your reading, but actually "remember" what you read! Learn a new hobby in just a few short days! You will be able to do all of this and more after you complete Ron White’s Memory in a Month program. Ron White was not born a prodigy or with a photographic memory. In fact, after struggling to make passing grades in college he finally gave up and dropped out. The truth is, Ron's memory was no better than yours before he taught himself these amazing techniques he's now offering to share with you. Ron spent years developing his own unique methods of memorization, speed reading and comprehension. He has taught these techniques to business professionals, students and US military members around the world. A few years ago, Ron set his sights on winning the USA Memory Championship using his unique memorization techniques. March 7th Ron's dream came true. He earned the title of USA Memory Champion! He is now proud to own the title of #1 memory in the NATION! That's on top of his previous accomplishment of being the Guinness World Record Holder. Today, Ron is offering to reveal his amazing memory techniques to you. Ron's techniques can work for anyone. Just imagine the incredible advantage you'll have in every aspect of life, once you take advantage of Ron's memory program. Ron’s live workshops sell out every time at $349 per person. Get the same knowledge in his Memory in a Month program for a small fraction of that. 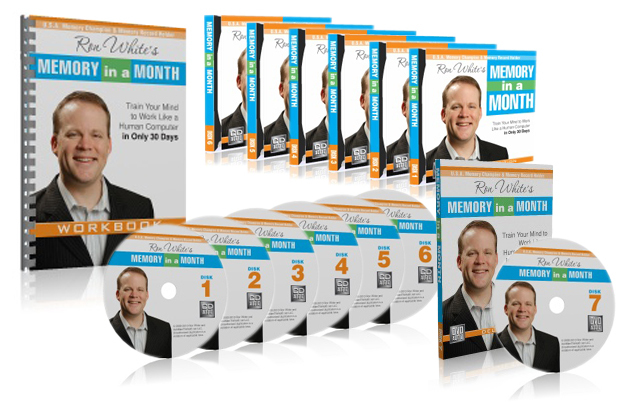 In just 10 minutes a day for thirty consecutive days Ron will show you how incredible your memory really is. Ron will teach you a 2,000-year-old technique developed by the Romans called ‘Loci’. This ancient system utilizes skills that we are all born with, but few know how to use. You will learn how to use this system to train your mind to access and retrieve information just like your computer. After you complete this program you will be able to store data in your memory for retrieval later. Day 30 – Summarize the memory system and prepare for the future with your new techniques! Your mind is incredible. If you cannot do these things you are not living up to your potential. Tap into your unused mental powers today! Ron will be the first to tell you, "What is amazing is not that I can do these things...it is amazing that I can teach ANYONE to do these things!" Learn how to use your memory to memorize 50 or more random items in just minutes! Albert Einstein was more than just a scientist and a genius. From college dropout to prominent scientist and a historical figure, Einstein was in every way a true success story and a person with many qualities worth emulating. 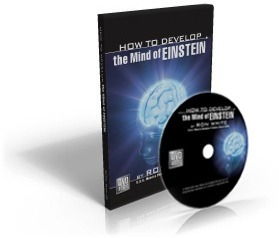 In How to Develop the Mind of Einstein, Ron White shares some of the lesser known facts about Einstein, his ideas on success, and his philosophy on life. By taking a look at how Einstein dealt with some of life's everyday issues, you too can build a model for your own success. DVD sells for $129. Free with next 100 purchases of Ron White's Memory in a Month. For the first time ever: Memory Training Techniques Used By The U.S. Military. 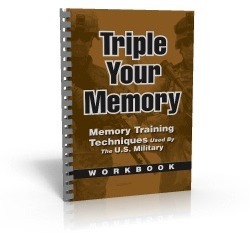 USA Memory Champion Ron White, a U.S. Military Intelligence Veteran of the war in Afghanistan, top-level techniques that you can use to triple your memory. Fully downloadable, 200+ page instructional workbook. $20 value. Free with next 100 purchases of Ron White's Memory in a Month. By studying baseball, you can learn a lot about life, success and failure. Ron is a huge baseball fan and his book is a collection of short success lessons that we can learn from our national pastime. "Ron, I Love baseball, and the book that you written is one of the greatest books I have read! Thank You for all the stories, wisdom, and inspiration. You're a true man, and in lesson 16 I would place you on the same rung with Johnny Oates. THANK YOU!" -- Catherine D.
Use Ron White’s Memory in a Month Risk Free for 30 Days. If you don’t experience a remarkably improved memory of at least 300%, simply return the program for a full, 100% refund — no questions asked.